More Power to the Laity! The Alban Institute, 2010. Pb., 193 pp., $18.00. Picture this: a small Episcopal congregation of seven members goes to visit its bishop to request closure, and the bishop replies, “No! You still have a mission in your community!” Fourteen years later, the worshiping community has more than quadrupled, includes people of all ages, sees itself as a ministering community, and serves the area around it via a soup kitchen, an afterschool program, and a community action organization. Can you imagine that happening in your judicatory? In Born of Water, Born of Spirit authors Sheryl Kujawa- Holbrook and Fredrica Harris Thompsett tell this (p. 80) and many other stories of small congregations reclaiming the power of the Holy Spirit, exercising the doctrine of the priesthood of all believers, and saying “Yes!” to a new call from God. They write out of their experience as Episcopal priests, seminary professors and directors of the Lilly-endowed Sustaining Pastoral Excellence Program at the Episcopal Divinity School in Cambridge, Massachusetts. What these congregations all have in common is that someone has encouraged and coached them to live fully into the meaning of their baptism, individually and as a congregation. •The baptized are summoned to a lifelong relationship with God and gifted for a lifetime of discipleship and mission. 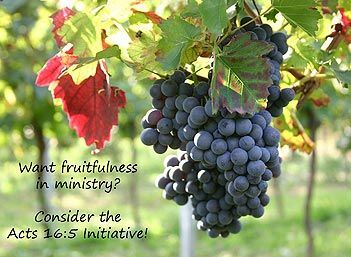 •The Holy Spirit is active in every Christian community regardless of size or wealth, and all the gifts that the congregation needs for ministry are already present in the congregation. •Each local congregation learns to discern its particular call from God in its particular context. •The people of God share the responsibilities of congregational life, preaching and worship included. •Instead of issuing blanket invitations to members to come from congregations to training events, ministry developers go to congregations to identify, train, coach and encourage indigenous leaders. Like Acts-era missionary teams, ministry developers spend an extended time in particular congregations, and then move on to help others. •In the Episcopal tradition, besides receiving training in areas of leadership such as spiritual formation and pastoral care, some church members are locally ordained as priests for their own congregations. This is not the easiest book to read. I sometimes got bogged down in the details of different ways to implement this approach. However, the authors provide many useful sidebars, including a chart comparing “The Church Viewed only as Institution” with “The Church Viewed Primarily as People of God” (p. 140). There is also an extensive annotated list of print, web-based, and DVD resources. Born of Water, Born of Spirit is certainly an essential reference for all who envision a fruitful future for small congregations. Yet it also offers a challenge to every judicatory and every congregation, even those who can still afford to structure their life around the work of ordained professionals. We all need to be asking: Do we truly believe in the power of the Holy Spirit? Do we truly believe in the priesthood of all believers? Do we truly want to equip all our saints for ministry? If the answer is “Yes!” then we might start hearing more and more stories of amazing renewal in congregations of all sizes. Coaching for Catching the Spirit? This week two elders and I were privileged to attend an inspiring seminar introducing New Hope Presbytery to the Acts 16:5 Initiative of the Vital Churches Institute. The Initiative is a three-year program of coaching aimed at helping pastors and congregational leaders to grow spiritually themselves as they guide the congregation to do that. The point of the process is to appreciate and bless the present people and ministries of the congregation while opening our minds and hearts to the future that God has in mind for the congregation. If my congregation and I discern that God is calling us to participate in Acts 16:5, it will be a program of continuing education that members of the congregation and I will undertake together. Acts 16:5 is not a program for “turning your church around,” but an opportunity for coaching in spiritual discernment. It is rooted in prayer and scripture, and recognizes two very important things: first, churches of any size can be vital and faithful; second, there is no one-size-fits-all program. I was impressed that the whole seminar was soaked with prayer. Folks in our flock are longing to go deeper spiritually and to find some way to connect with the community around the church. We have so much to share with the world around us! Will Acts 16:5 help us do this? Time for some more prayer, and some more prayer-soaked conversation. Check out the Vital Churches Institute website. There are lots of available resources, including a free weekly e-letter of encouragement you can sign up for. A note to folks in New Hope Presbytery: if you missed this week’s seminar, there will be another opportunity in May 2011 to learn about Acts 16:5. A four-hour seminar will be offered in two locations, one in the East and one in the West. Where in the world is God taking us as a church? How in the world are we going to introduce people to Jesus who aren’t primed and ready in any way? One thing’s for certain. Simply inviting people to church activities is not going to cut it any more. God is going to have to show us how to be apostolic–sent out–again. On his blog Steve’s Stuff, Columbia Theological Seminary President Steve Hayner posts videos and articles that address these questions and more. He passes them on as he comes across them. I recommend subscribing to his blog feed. Steve’s most recent post is a 7-minute video in which Alan Hirsch discusses why the church in its present forms, even in its seemingly most popular forms, cannot reach 60% of the population out there. Find out more about Alan Hirsch here. Hirsch says that this DNA is in every believer. Every believer is a church planter, which means every believer is a seed, a DNA carrier, which tells me that every believer is a mustard seed.